Ruby have fewer origin, mainly in Burma, Thailand, Sri Lanka, Vietnam, India, Tanzania, and China etc.. Most of the world's rubies are found in alluvial deposits in small areas. The more valuable ruby,their living environment more harsh. Similarly, the mining conditions of ruby is very difficult, for example, in Burma ruby, usually it is nedd to stripped of thick cover to reach 15 feet with gravel stones. Then, it can truly be mine. There are two main origin of Burma rubies, one of Burma Mogok; the other is Burma Bangladesh prime. Myanmar Mogok is the world's most beautiful ruby origin, it is well- known for pigeon blood red ruby, so that "Burma Ruby" became synonymous with commercial quality ruby. Myanmar Mogok ruby with bright roses red - the highest grade of red known as "pigeon blood red", that is pure red, and high saturation. Significant fluorescence under the effect of sunlight, its various facets showed a bright red, shining. Often it is rich in small rutile needles fog to form stars. Uneven color distribution. Thailand is also a major producing countries and ruby trading center, it was reported that nearly 70% of world production high-quality rubies is from Thailand. Ruby origin is in southeastern Thailand, Buri. Thai Ruby Fe content was high, darker, less transparent, more dark red - brownish red. Non-daylight fluorescent effect, only in the light direct facet is bright, the other facet is black. More uniform color. Lack of rutile-like inclusions, so no star ruby variety. 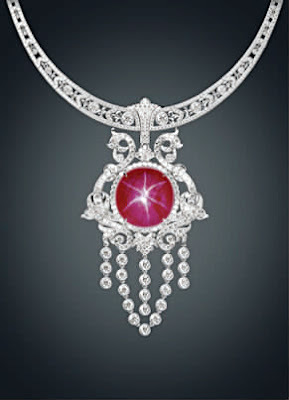 The Ruby of Sri Lanka is well known for good transparent and soft colors. And larger particles, the greater change of color, from light red to red, pink, reddish brown or brown red to cherry red. High-end product is Bright red with slightly pink and yellow, often called cherry red or water red. Also the ribbon development, rutile needle thin, long and uniform. The common color of Tanzania ruby is purple color, orange red, and pink and red are less, and it is related with high Fe, Ti, and the low Cr content. Most of ruby without Fracture healing , and filled with foreign particles, and to decrease the transparency of the ruby. village ruby deposits, and basalt in the southern region of the ruby deposits. Ruby Lu An output of which the largest, best quality ruby, second to Caizhou ruby, ruby are both taken from the residual and slope sediments. Vietnamese ruby color from pink to red, many with a purple hue, rare pigeon blood red, the color of a stream striated banding phenomenon. China Ruby mainly found in Yunnan, Anhui, Qinghai etc., the Yunnan ruby is slightly better than other ruby. The Yunnan ruby is produced in the western Yunnan area Ailaoshan metamorphic phlogopite marble, but the value is the secondary mining placer, which extracted the ruby size 1-10mm, the color was red and roses red, nuanced and uniform. But the split management and development, inclusion and high impurity content, most of them can only be used as arc precious stones, with quality faceted original stone are rare .